For years I took it as a challenge. Every man does. There is something about being the backyard BBQ meister that is a part of the man-card validation. With an open flame, smoke, danger around burning hot metal and of course the constant presence of plenty of sauce every man dons his apron and grabs his tools. A turning fork with long tines is a must. The bigger the basting brush, the better. It helps to have a football game on in the background. Baseball will do. Here down in the south when there is plenty of comfortable weather in the winter, ice hockey will do too. In the early days I would get the briquettes ready. Lighting up the charcoal was a matter of timing. Firing up these morsels needed time to prepare. Nothing happened quickly. Once the briquettes were covered with white ash, they were ready to cook up the dinner. The challenge was chicken. They always dripped grease while cooking that caused flare ups and inevitably the chicken was served totally black, burned to a crisped. I have dumped more than one meal in the garbage. Gas grills were not much better for me. The grease from cooking chicken pieces always caught fire. 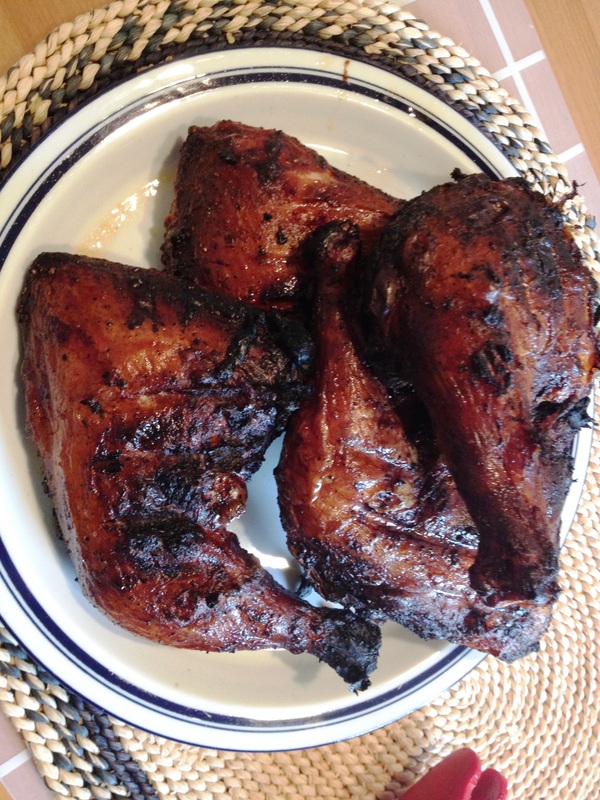 Again, the crispy burned and totally blackened chicken was not uncommon. It was always frustrating. If I took the chicken out too early, it wasn’t always cooked thoroughly. Trying to get them back on the grill or surrendering to the microwave just added to the annoyance. I really wanted a solution. Enter the Traeger grill. These are the smokers designed to burn wood pellets. The same inventor who came up with the wood pellet stove for heating homes transferred the same concepts of temperature control to a smoker/grill. I thought through the years of frustration when it came to grilling chicken. It was time to test our new grill with chicken. We had already enjoyed beef and lamb. Now, it was time for my main grilling nemesis. We had well seasoned chicken legs with lemon and herbs. They looked great, smelled even better. Once on the pre-heated grill, I closed the lid. It was time to trust the indirect heat. After the time rang, I headed out the backyard with eager anticipation. The smoke was pumping out of the grill vents. Wonderful aroma was increasing my anticipation. Deftly I opened the lid. When the smoke cleared, I was ecstatic! The chicken was cooked perfectly! Yay! BBQ definitely tastes best when it’s done with coal.